Mozilla Firefox is already one of the most popular desktop browsers and with its increasing presence on android phones, it is catching up in mobile segment as well. Another beauty of using Mozilla Firefox on android mobile is that it supports addons and as you know how addons can greatly enhance browsing experience by adding productive features and additional functions to our regular browser. Here in this article, we’ll list Top 4 Addons for Firefox Mobile version. 1. URL Fixer – As the name suggests, this addon fixes or corrects common typos in urls of most websites. Making typing mistakes while entering urls on mobile phones are common. So, this is where URL Fixer comes to help. For example, if you typed Google.con, it will automatically correct the same to appropriate Google.com. Likewise, if you typed Facebok.com by mistake, it’ll correct the url to Facebook.com. URL Fixer works for most of the websites and tries to fix all common url typing mistakes. 2. Phony – This useful addon helps you to change browser user-agent so that you could impersonate a differnet browser, like Firefox Desktop or Google Chrome or Internet Explorer, or even iPad, iPhone; when visiting any website. Many websites rely on browser user-agent to serve specific version of the website. Although, Firefox has inbuilt Request Desktop site option, it may not work sometime. So, you can change the browser agent to, say Firefox Desktop and then visit any website. The website will assume that you’re visiting from Firefox Desktop version and so will serve you desktop version of the website instead of mobile version. Phony addon just changes the browser user-agent, so it may not work on all websites for requesting desktop version of the website because certain websites rely on css media queries i.e. screen resolution of your device to serve appropriate version of the website. So, even if you change your browser agent, the website may serve your mobile version. Phony addon can be used in different scenarios as well where you need to change user-agent, fox example of iPhone or iPad to request that version of a website. 3. 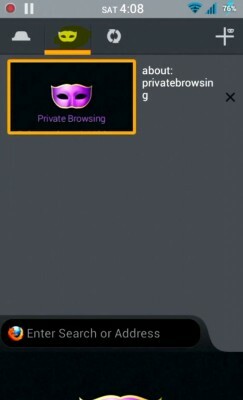 Full Screen – With this addon, you can make Firefox android browser go completely full screen. In full screen mode, nothing except the webpage is visible. Even the browser controls are not visible. To open new tab in full screen mode, you need to tap phone option/menu button and then choose the appropriate option. In full screen view, your phone’s status bar is also not visible. You can exit full screen view by tapping on phone’s option button and selecting Full Screen option. Of course, this option will only be visible after installing of this addon. 4. 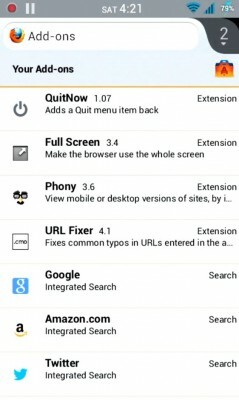 QuitNow – From Mozilla Firefox 20 onwards, they’ve removed Quit option and there is no way you can enable this option in Firefox browser. To exit Firefox, you need to tap on back button continuously unless you get out of it, but even then, Firefox runs in suspended state. 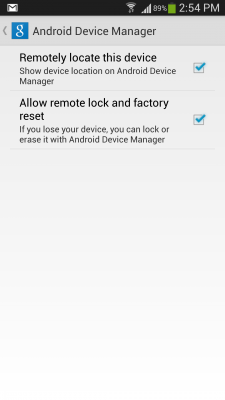 So, either you need to kill Firefox process from task manager in your android phone, or you need to install this addon. By installing this addon, Quit option is added to firefox menu so that you can completely close firefox browser once your browsing session is over. To install these addons, just visit home of Firefox android and scroll down where you’ll see a link to browse addons. Visit that link. A webpage will open. In the search box type the name of the desired addon and from there install them. Most addons install instantly, whereas some addons may require you to restart firefox browser. You can also browse featured addons there, so go through those addons listed and try other useful addons as well apart from those listed here. I love that QuitNow add-on ;-) But I can’t believe you didn’t include Adblock Plus, my personal favorite !